One of the things (among many) that I like about raising sheep is that it requires relatively little in the way of fancy equipment or expensive tools. But the tools that I do require are critical - just as critical as a rope, comfortable saddle and good horse might be to a cowboy. Earlier this week, I used Facebook to ask my fellow shepherds about the three tools they find essential. We had a few laughs about some of the answers, but I think their feedback is quite interesting! First, some humor! My friend Rex Williams (who operates a sheep dairy in Sonoma County with his wife, Kerry) said, "I have always said a good corral is cheaper than a divorce attorney" - Rex (who is also an auctioneer, like me) is always good for a laugh! Joking aside, though, I have found (as has Rex) that working sheep with my spouse can be stressful unless we have the right set-up. I'm sure that my cattle-raising friends have had similar experiences! And I'll admit (at least on this blog - don't tell Samia) that I'm usually the source of most of the stress! My friend Liz Hubbard, who runs sheep with her husband Mike in Oregon (along with cows in Oregon and here in Placer County in the winter), told me, "My favorite tools are my border collie, my four-wheeler, and Mike - well, Mike is not a tool, but he's really nice and will hold a sheep if I ask or even shear one." I told her I was glad to hear Mike was not a tool! Finally, John Kelsey, an old college buddy with whom I've recently reconnected on Facebook - and who loves lamb but doesn't raise sheep, said, "A fork, a knife, and a grill." Since I just finished up a dinner of barbecued lamb sirloin chops, I'd have to agree! Much of the equipment cited by my friends was a variation on these themes - many people talked about how sorting gates, v-panels and well-designed portable corrals made the work more efficient. Several friends have recently ordered portable sheep "yards" (that's shepherd-language for corrals) from New Zealand - the Kiwis know how to work sheep efficiently! I'm looking forward to helping them work sheep through these systems in the near future - I'm sure I'll be envious! Many of us who operate pasture- or rangeland-based systems also rely on tools that allow us to catch sheep in the pasture. 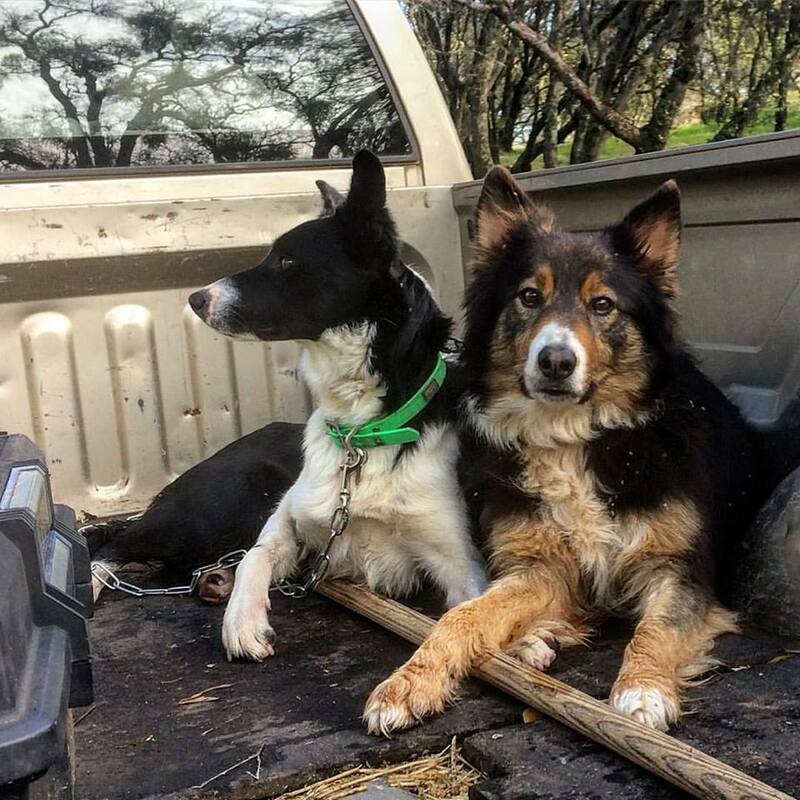 I know a few sheep ranchers who use lariats (like a cowboy), but many of us rely on leg crooks and border collies to catch sheep that need attention. A number of friends said they liked the crooks available at Premier One Supplies. I prefer the old-style leg crooks I can get from my friend Will Griggs at Utah Wool. These steel crooks can be attached to a wood handle - and with the help of one of my dogs, they allow me to catch most sheep without running them into the corrals. Containing sheep on pasture - and protecting them from predators - requires a different set of tools. Those of us who manage small- to mid-sized flocks on pasture often rely on electric fencing. The consensus among my Facebook friends is that Premier electro-net - which we all seem to purchase from LiveWire Products in Penn Valley, CA, is the best product out there! Give me electro-net powered at 6,000 volts, and a good livestock guardian dog, and I can sleep at night knowing the coyotes and mountain lions won't be eating my sheep! All of us who have raised sheep for very long have looked for ways to make vaccinations, de-worming and foot-trimming easier. Several friends said that they couldn't get along without their vaccine guns (various models and brands were suggested). Backpack drenchers (which hold dewormer and have a "hook" that makes putting the right amount of dewormer in the back of a ewe's mouth easy) are invaluable. Some friends use "deck chairs" or "sheep hammocks" to hold the sheep during vaccinations and foot trimming. And speaking of foot trimming, I've found that the ARS hoof trimmers (again, available from Premier) to be my favorite. Since most of us raise sheep both as an avocation and as a business, business management tools are also important. Dan Dinova said his cell phone is an important tool for trouble-shoothing and networking. Jaimie Irwin said Quickbooks was indispensable. As shepherds, many of us spend much of our time outside, regardless of the weather. Several people said good rain gear and head wear were important "tools." I'm partial to wool garments (as many of my fellow sheep-people are) - I've got Filson and Pendleton garments that are older than I am! I've recently discovered Darn Tough and Farm-to-Feet wool socks - both brands use U.S. wool and are guaranteed for life! My friends John Wilkes (originally from the UK) and Derrick Adamache (who shears our sheep), have turned me on to Swandri bush shirts from New Zealand - I'm gonna have to save up! That's the thing about wool clothing, though - it lasts forever! Many of the tools we all use are pretty basic. I've carried a pocket knife since I was about 7 years old (I'd probably be kicked out of school today) - and I suspect that most of my fellow shepherds have done the same. There are a few things that I won't skimp on - good boots, cold-weather clothing, and pocket knives. In my mind, there's no point in carrying a knife that won't hold an edge. Jon Carter said he carries a Benchmade knife; I've had great luck with US-made Buck knives, and I currently carry a razor-sharp Spyderco. A number of folks also said they carry rope or twine - although most shepherds don't use baling twine (which is a leading cause of wool contamination). A piece of rope always comes in handy - for tying fences together, leading a wayward guardian dog back to the sheep, or restraining a ewe. My friend Lana Rowley, who ranches in southeastern Oregon, once told me that she'd never regretted having a gun or a dog with her. I've never been in the habit of having a firearm with me at all times, but I've never been sorry to have a border collie with me. Our sheep dogs are more than companions - they're essential partners in much of our work. And while I've never had to shoot a predator in the act of killing a sheep, I have had to run home for my Remington pump .22 when I've needed to humanely euthanize a dying ewe. All of this brings me back to the question I originally asked my friends - "As a shepherd, what are the three things you couldn't do with out?" Considering our own operation, it comes down to this: Give me a good border collie, some electric fence, and a pocket knife, and I can manage! I hope the shepherds who happen to read this post will add their own perspectives! Great article Dan, a funny yet, educational read this early AM! Thank you. Thanks, Karen! Have a great day!